Consolidation is happening everywhere. Global Retailers are expanding. Drug stores are selling fresh food. Food stores and convenience stores are selling prepared meals. And Retailers and Suppliers / Manufacturers are selling in the omni channel. The retail and consumer packaged goods market is changing every day. The accelerating trends within the retail and consumer packaged goods have increased the importance of category-based thinking and approach, and a requirement for more collaboration between Retailers and Supplier / Manufacturer partners. The category management approach that was developed over 30 years ago doesn’t reflect these changing trends. The Category Management Association is currently developing CatMan 2.0™, which is an ambitious attempt to create a comprehensively redesigned discipline that benefits from the past 20 years of enhancements including the remarkable influence of the digital revolution. In this blog I’m going to focus on two areas that CatMan 2.0 identifies as areas that need enhancement or change, including preparation and category assessment. 1. PREPARATION, which includes organizational design, internal alignment and internal processes. The whole approach of how Retailers and Suppliers / Manufacturers work together needs to change. The traditional sales approach that many companies continue to use isn’t working. Research & Development and Marketing can’t work in isolation to develop new products for their brands, and need to start understanding categories (vs brand only) and their Retailer’s shoppers (vs brand consumers). In a perfect collaborative world, Retailers and Suppliers / Manufacturers would work together to find Shopper solutions that align with their internal organizational goals & objectives. Moving to a more collaborative approach requires many different elements – including trust, resources, data, aligned strategies and other elements. Before Retailers and Suppliers / Manufacturers can collaborate, they need to ensure they have their internal team aligned. It is incredible how many organizations have silos in their organizations that inhibit internal collaboration. Some departments think category, others look at brand, some have access to valuable shopper information, others don’t. There needs to be an aligned approach across the organization, including gold standards and best practices, before there’s possibility for collaboration with external partners. It’s also important for organizations to understand that not all collaboration is created equal. The level of collaboration that is achievable is based on a combination of requirements, including data & tools, research and personnel. The less you have in each of these three requirements, the lower the level of collaboration is available, and subsequently the level of output will range from tactical or transactional solutions in lower levels of collaboration, up to shopper-focused solutions in the higher levels of collaboration. Your next step? Consider how strategic your organization is at providing overarching strategies to your organization as it relates to category, shopper, data and insights and collaboration. What are your biggest areas of opportunity? 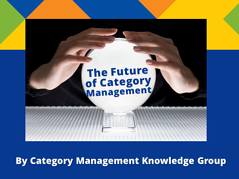 Category Assessment is another opportunity for change and/or enhancement to category management. Analytics will be more forward-looking and predictive. With our quickly changing mobile-focused society, closer working relationships between Retailers and Suppliers / Manufacturers will be a requirement to achieve effectiveness. Because of the complexity of new data sources and looking for patterns and relationships across data sources, Predictive Analytics are becoming more prevalent among Retailers and Suppliers / Manufacturers. Predictive Analytics analyze information from existing data sets in order to identify patterns and relationships that we can use to predict future outcomes and trends. Big data affects category assessment in a big way. The advances of technology, shopper purchase behavior and mobile will create a huge leap of data richness and content. The ability to data mine and effectively use this data will be critical. As data becomes more complex, so too do the category reviews that are completed. I recently ran a webinar for over 200 of our students on “Best in Class Category Reviews”. We identified that a category review has several different purposes, and most organizations don’t differentiate between the different types of category reviews. Purposes can range from being part of a formal category review process for a Retailer to internal business reviews or brand reviews or category health reviews to new innovations in a category. You shouldn’t be using the same category review for these different purposes. The biggest complaint from participants in the webinar was the amount of time required to pull the data together and get it set up properly. This confirms the need to incorporate standards & best practices for category reviews up at a strategic level for organizations. In two weeks from now I’ll have another podcast that will capture how Shopper influence and the omni-channel are changing and the implications that this has on category management.